Hi, I'm new to this forum and also somewhat to the wonderful world of antenna theory and reality! I have a cabin in a HOA governed gated community up in Show Low, AZ. There are only two TV channels relatively close retransmitting from Phoenix. Both Fox Channel 10 (transmits on real channel 7 VHF-High) and PBS KAET Channel 8 (transmits on real Channel 3 VHF-Low) transmitters are located at Porter Mountain about 8 miles away. Due to HOA requirements the antenna is installed in the attic at 115 degrees azimuth towards Porter Mountain. I probably went over the top and bought/installed a Winegard 8200U in the attic together with (from memory) a Channel Master Pre-Amp. I get good reception with FOX on real channel 7 but can only occasionally lock into PBS on real channel 3. While performing physical checks of the antenna I noticed that with the antenna combiner cartridge removed that resistance between the UHF terminals was >200 ohms but for VHF the resistance is <2 ohms which does not seem right to me? Physical inspection (in a very tight attic space) revealed no issues including high resistance between the VHF antenna rods and the central antenna rod used for mounting which is what I expected. I may be chasing a "non-issue" since FOX on real channel 7 comes in without problems. Question: Is there an electrical diagram for the Winegard 8200 antenna available? Thoughts/Comments on my findings? Lastly, I've read that a Pre-amp does not help for VHF-Low channels and would do better with it removed? Thoughts? Show Low is a really nice place. 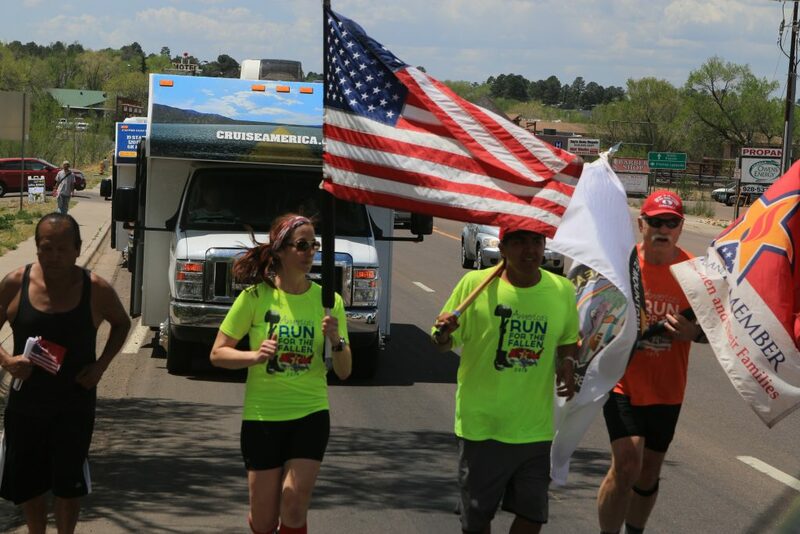 I was there last April when Run For The Fallen came through. I actually RAN through Show Low! Now, running at 7,000 elevation when you're used to 700 feet is hard enough, but throw in that I ain't as young as I used to be... well, let's just say I was really gasping! I'm the old guy on the right! 2. Remove the pre-amplifier and retest. For strong signal zones such as yours is calculated to be, they usually create new problems where none existed. Try that and see what happens. VHF low is plagued with reception issues caused by local electrical noise so it might take some work to see if that's the case. 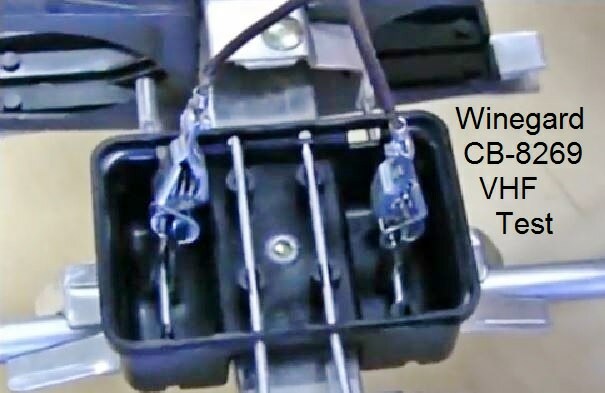 Winegard has a video floating around that shows how to test for a failed coupler board. It involves removing the board and making a substitute connection with a common matching transformer equipped with alligator clips. Rabbit73 probably has it bookmarked, hopefully he'll drop in and comment. I've never poked around inside their coupler box. Last edited by ADTech; 4-Apr-2019 at 8:49 PM. Show Low at 6300ft and the White Mountains are a great place to hide out during the Summer when we hit 110+ Fahrenheit down in Phoenix! ... You've got to acclimatize yourself to this altitude before doing any serious running!! Many Thanks for your suggestions, I'll definitely remove the Pre-amp as a test next time I'm up at the Cabin. As for the concern mentioned regarding low resistance across the VHF poles, please note this low VHF resistance measurement was taken at the Antenna with the antenna combiner cartridge removed (hence the combiner cartridge is outside of the equation). I've seen the Winegard video regarding a possible failed antenna combiner cartridge. In fact, the method recommended by Rabbit73 to test whether the cartridge is faulty or not by removing the cartridge and connecting a 300 ohm to 75 ohm impedance transformer directly to the VHF antenna rails is the primary reason why I question the approx 2 ohm reading I get across the VHF rails with my multimeter. Yeah, I only had two days to acclimate to the altitude on that trip as we got to Pinetop on Thursday afternoon. Needed more. By Sunday afternoon we were up in Holbrook and it was a lot easier. I've never examined the Winegard arrangement so I don't know what to expect for a DC resistance. I also do not know if that is a valid and useful test or a red herring. You might contact them directly and ask their support staff and see if anyone knows. Since it sounds like this is a location that is visited rather than a primary residence, I'd approach it with a two-step plan. Pick up or order the parts to make the test jig (balun & clips) so you have them if needed. Plan on removing the amp and its power inserter as your first step. Nice to see so many others enjoying Arizona! VHF low is always going to have interference issues. Last edited by JoeAZ; 5-Apr-2019 at 1:26 PM. Both Fox Channel 10 (transmits on real channel 7 VHF-High) and PBS KAET Channel 8 (transmits on real Channel 3 VHF-Low) transmitters are located at Porter Mountain about 8 miles away. Due to HOA requirements the antenna is installed in the attic at 115 degrees azimuth towards Porter Mountain. Hello, Peter; welcome to the forum. You need some kind of antenna for K03FB on VHF-Low channel 3. There aren't many choices; the 8200 was a good choice. The signals will be attenuated by the attic location, but if you can receive K07OJ that is running only 33 watts ERP, you should be able to receive K03FB running 300 watts ERP. While performing physical checks of the antenna I noticed that with the antenna combiner cartridge removed that resistance between the UHF terminals was >200 ohms but for VHF the resistance is <2 ohms which does not seem right to me? Physical inspection (in a very tight attic space) revealed no issues including high resistance between the VHF antenna rods and the central antenna rod used for mounting which is what I expected. Resistance measurements with a DC ohmmeter are inconclusive when you are working with RF. I may be chasing a "non-issue" since FOX on real channel 7 comes in without problems. You do have an issue, but we haven't figured it out yet. There could be a problem with the antenna that allows it to receive 7 better than 3, or it could be, as ADTech mentioned, you have electrical interference on VHF-Low that raises the noise floor and reduces the SNR of 3. 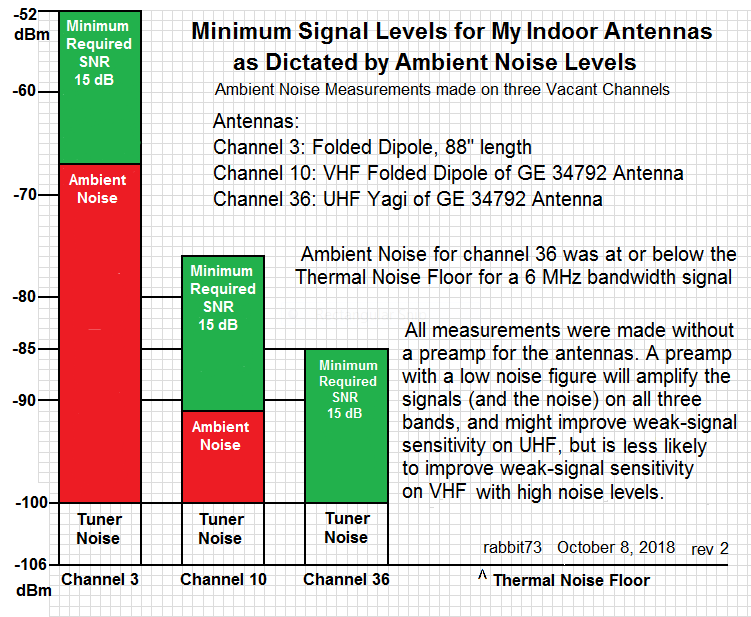 I favor the second possibility because I have made noise measurements for indoor antenna locations that indicate much stronger signals are needed on VHF-Low than on VHF-High for good reception. Noise can come from LED and CFL lamps, electric motors, battery chargers, and switchmode power supplies (AC adapter) for laptops. Question: Is there an electrical diagram for the Winegard 8200 antenna available? On VHF-Low, a preamp makes the signal and the noise stronger, so you end up right where you started with no improvement. Which CM preamp are you using? If you can not measure it, you can not improve it. Last edited by rabbit73; 6-Apr-2019 at 3:07 PM. Did you actually try to receive 3 and 7 with the balun attached to the VHF wires? If you did, and 7 was better than 3, you can try a channel 3 folded dipole as an antenna for 3. If you still can't receive 3, either they are running at reduced power or you have a high noise level on VHF-Low from electrical interference. 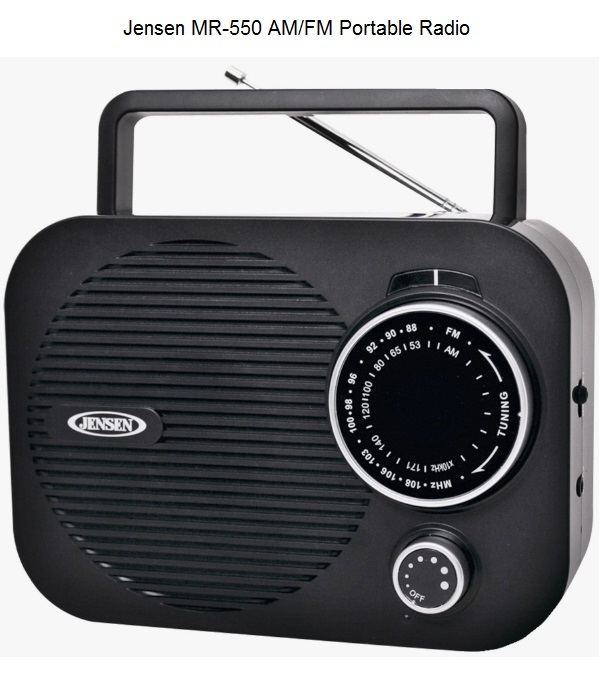 I use a portable radio tuned to a vacant channel on the AM broadcast band, first the low end then the high end, to hunt for noise sources. Last edited by rabbit73; 6-Apr-2019 at 12:19 AM. "Did you actually try to receive 3 and 7 with the balun attached to the VHF wires?" Nope, but I'll be up at the cabin next weekend and will test. "If you did, and 7 was better than 3, you can try a channel 3 folded dipole as an antenna for 3"
Good idea, I'll go looking for some 300 ohm twin-lead, make up an 88" folded dipole and test. "Which CM preamp are you using? " Not sure, I'll check while up at the cabin next weekend and report back. Testing completed this morning at the HD8200U antenna mounted in the attic with a portable Television connected directly to the balun (bypassing pre-amp and cabin coax) and a second test with the balun removed and VHF connected using crocodile clips with a 300 to 75 ohm converter. In both cases, real channel 7 comes in with good quality but PBS on real channel 3 is not picked up during a scan. After tweaking antenna direction for real channel 7, I note through my main TV and PC that the Hauppauge signal monitor shows a SNR in the upper 20's to low 30's but again real channel 3 cannot be found during the scan. As suggested, I built a real channel 3 folded dipole (88") and tested both outside on the cabin deck and up in the attic. Both tests resulted in real channel 7 being scanned and providing a reasonable signal, real channel 3 however could not be found during scans. The above results indicate to me that my HD8200U antenna is likely working just fine. The balun, pre-amp and cabin coax cabling are not causing problems. Antenna direction is fine since I was able to tweak against real channel 7 which is also located on Porter Mountain…… Other Thoughts Welcome!! I do have the attic and trees in the LOS to Porter Mountain but would have thought channel 3 would have provided better penetration than channel 7?? Low power of 300 watts ERP bothers me compared to other stations around the nation on VHF-Low?? I guess that I now need to look at interference issues in the area but not sure how one would go about resolving (unless it is being generated from within the home). One last comment, I have driven around my neighborhood and have not found other homes with external OTA antennas, all seem to be using cable or direct/dish satellite TV. Either it isn't on the air or you have a high noise level on CH3. I suggest you call the KAET station engineer at ASU. Last edited by rabbit73; 14-Apr-2019 at 2:19 AM. Flagstaff, Mingus Mtn and Prescott are all unusual in their performance. I receive the best signal when the antennas are turned about 45 degrees. is 270 watts on a good day. I ran a test this morning using the Hauppauge signal monitor and scanning real channel 3 with the Winegard HD8200U. I found there was NOT a measurable signal to lock onto for channel 3, same test with real channel 7 (FOX) worked fine. I then took the channel 3 folded dipole (88") and a portable television out on the road and found that even below the transmitter at Porter Mountain there is not a signal on channel 3 (K03FB-PBS). Again real channel 7 transmitting from the same location was fine. The last time I was in Show Low a month ago I'm certain the transmitter was operational. I'll contact the KAET station engineer tomorrow per your suggestion. Not sure I understand the need to move the antenna approx 45 degrees to receive a good signal on PBS?? I'll contact the PBS station engineer and try to find out why the Porter Mountain transmitter is apparently down. "Not sure I understand the need to move the antenna approx 45 degrees to receive a good signal on PBS?? " perpendicular to the ground, (+) the KAET signals are pretty marginal.